The Real Jardín Botánico's herbarium is a key component of its scientific and research work. It is the largest herbarium in Spain and one of the most representative in Europe. 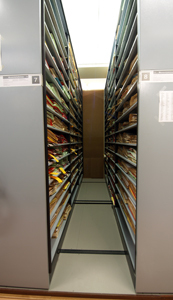 The herbarium houses over a million specimens organised according to standardised classification systems (see Organisation of the Herbarium). It represents all plant groups and has a particularly important collection of specimens from the Iberian Peninsula, together with type specimens of South American plants gathered during historical expeditions. The herbarium's collections are continually growing thanks to the research work of the RJB's scientists, as well as donations, acquisitions and exchanges of specimens with other herbaria. The Real Jardín Botánico de Madrid Herbarium is a restricted-use public collection. Under the regulations governing the management of the CSIC's collections, which were passed by its governing board on 25 July 1991, the Real Jardín Botánico de Madrid Herbarium is the property of the CSIC and is considered a national asset.